Ethiopia 2010: "Hope deferred makes the heart sick.."
A few months earlier we got word that our trip to Ethiopia had been suspended indefinitely. I was distraught. We all were. The travel curriculum of the health science center was getting a major revamping and as a result, the trip was placed on hold till more concrete criteria for travel had been set. Our first meeting as a team, after discovering the news, was, well, quite lugubrious; for lack of a more complex word. These hopes we'd had were now adjourned, arrested, dashed, deferred. On April 22nd, the team met once again. It was unlike any other meeting we'd had before. Meetings before this one had been to discuss how we could be preparing for our trip to Ethiopia. Meetings before this one had been about new opportunities for service in Ethiopia. This was different. 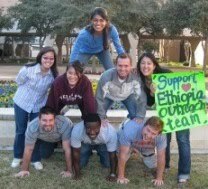 We had met no longer as the Ethiopia Outreach team; but as the soon to be "A-destination-other-than-Ethiopia" Outreach team. We were convening to look at other options for the summer. The drastic length of suspension of the trip had despaired us of hope for Ethiopia. Now, we sought plan B's and C's. During the meeting on April 22nd, as we conclude discussing our options for travel else where, Katie decides to check her email. Behold, there in her inbox is a letter from the president of UTHSCSA. Katie exclaims her finding. Our eyes widen. We immediately perk up in our seats. I scoot my chair closer to Katie's computer. Annie gets up and is now peering over Katie's shoulder. Katie begins reading quickly and aloud through the letter to get to the portion that will state the fate of the trip. Soon, it comes: "... I have decided to allow this summer's trip to Ethiopia.."
We get to go! We get to go!! Though we were exhausted from the wait, we knew now that there was hope again! The desire is still on course to be fulfilled. What now lays ahead of us is immense fundraising and preparation. Life will bloom from the seeds of service and patient-care that this trip will plant in us. We are eager. Roots of hope are reaching and establishing in us. We are filled with it.